How does Santa get all of his work done in one night? How does he know when a kid has been bad? These are the questions children around the world have written in letters to Mrs. Claus. Answering those letters is a daunting task, but Santa's wife is up to the challenge, along with the help of her elves. The 34 Crook County Middle School Production Company students performed "Dear Mrs. Claus" Thursday and Friday for both students and the community on the CCMS stage. "This was our first performance at our own stage right here at the middle school in a very long time," said CCMS Production Company advisor Cally Modin, referencing the stage in the cafeteria. 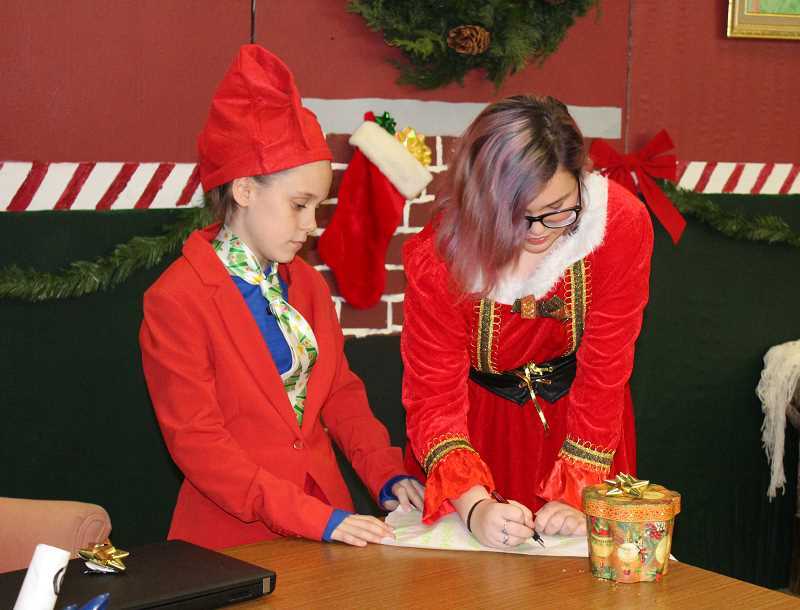 The play, by Alexi Alfieri, shares how one week before Christmas, Mrs. Claus is delighted to be done with her long to-do list. However, one last task has suddenly appeared: answering her mail. Mrs. Claus gets help in the form of her Personal Elf Assistant, Buddy. Together, the two of them look over her large pile of letters, asking some tough questions about the big guy and his operation. How do reindeer really fly? Why does Santa wear that silly red suit? Knowing they must find a way to answer these questions, Mrs. Claus and Buddy begin talking to elves from every department of the North Pole: the Mail Room, Communication and Navigation, Reindeer Flight Design, and Santa's Pit Crew being just a few. And during their investigation, Mrs. Claus not only learns a thing or two about the North Pole but a little something about her "highly professional" elf assistant as well. In the end, after satisfactorily answering her mail without somehow revealing all the secrets of the North Pole, Mrs. Claus is finally done with her to-do list … she thinks. "This program helps students to gain valuable life skills while having fun," Modin said of CCMS Production Company. "Our goal is to create a production that shows off our hard work and growing talent." The students designed and created the set and props for "Dear Mrs. Claus." In order for more students to get acting experience, two students were chosen to play each of the lead roles, and they took turns acting in the performances. Susan Williams plays the lead role of Mrs. Claus. This is her sixth play, and she says she likes that in the Production Company everyone works hard and is dedicated. 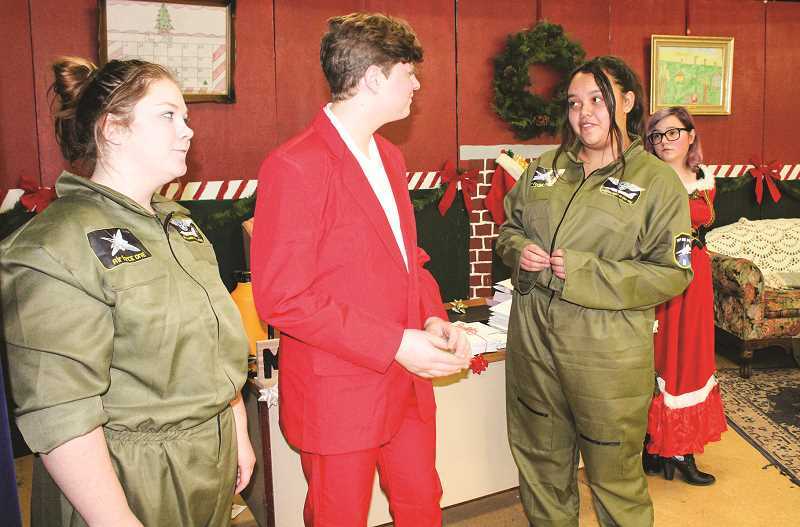 "The audience should know that this isn't just a simple Christmas play, and you should expect to laugh," said Wylee Chavez, who plays a lead role of Buddy, the elf, and has been in more than 10 plays. Dylanne Smith, who also plays the role of Buddy, said, "A lot of work went into this play, and you should enjoy it." Modin says her students enjoy performing for the community. "We have a great time putting them on, and we hope people enjoy watching them," she said.